Propellor is a creative design studio that values collaboration and sustainability, as well as “sleeping under the stars” and “drifting in a canoe". 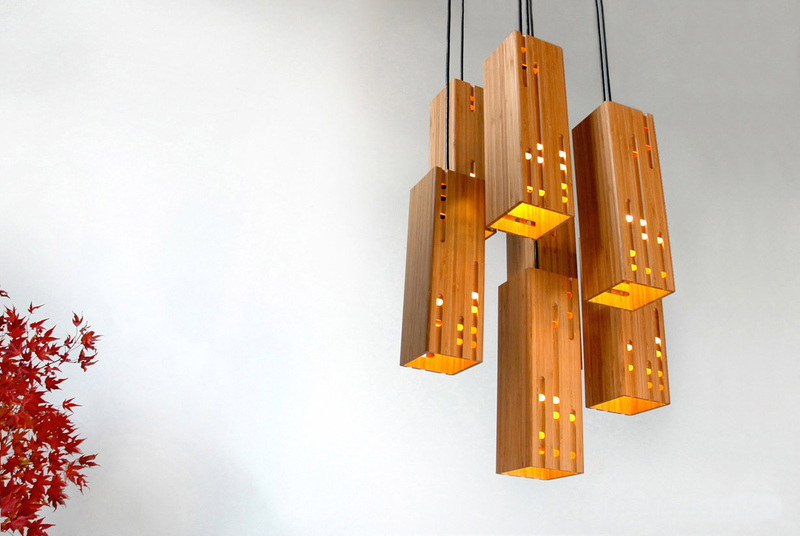 These Canadian principles inspired Propellor's wide range of customizable lighting products made by hand in Vancouver. Their designs mimic the urban and rural landscapes of Canada, and explore the idea of ecological modern design. 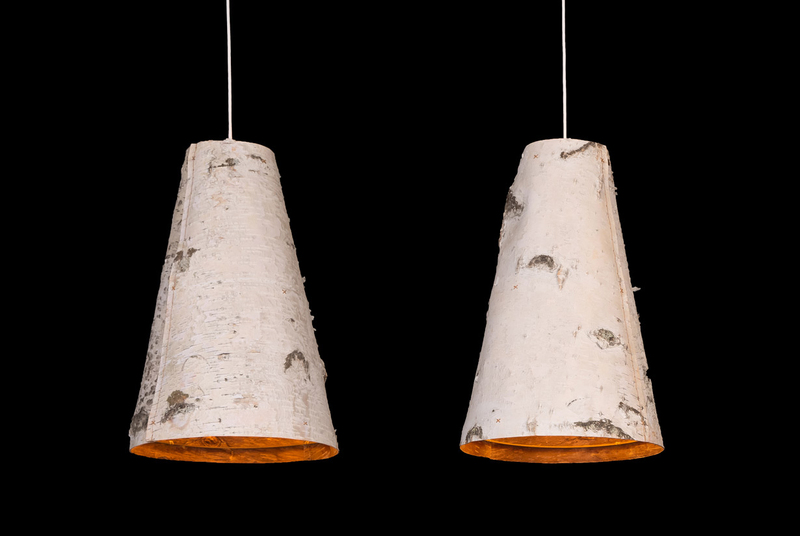 The “Ono Birch Light” (below) utilizes untreated birch bark for its stunning raw texture and pattern. The flexible bark is fitted overtop of a metal frame, and is stitched together to complete the fixture. Another light sculpture created with the forest in mind is the “Orée Light”. 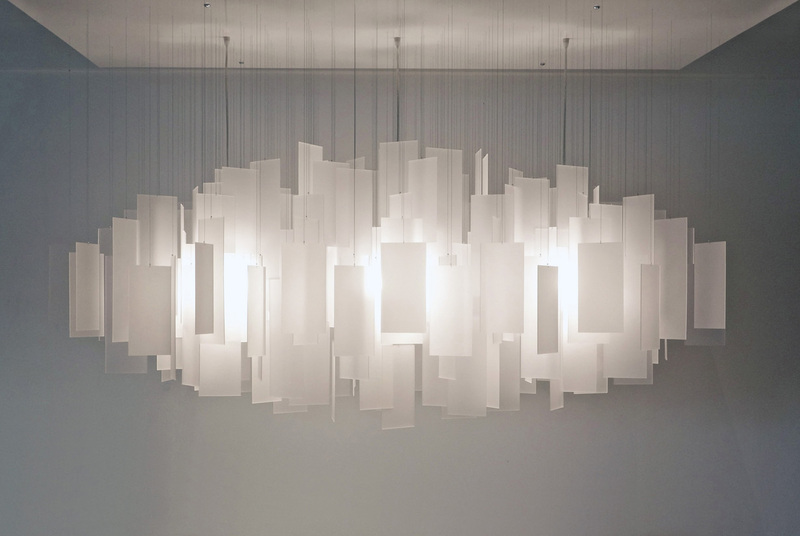 The piece mimics the way that sunlight filters through a cluster of trees. The symmetrical components of the fixture, made from pieces of bleached oak, hang gracefully in an oval arrangement. Inspiration for this piece came to the creators while canoeing in the Canadian wilderness. Canada is a country a mari usque ad mare, and the beautiful Canadian coastline is another environment that stimulates artists’ creativity. 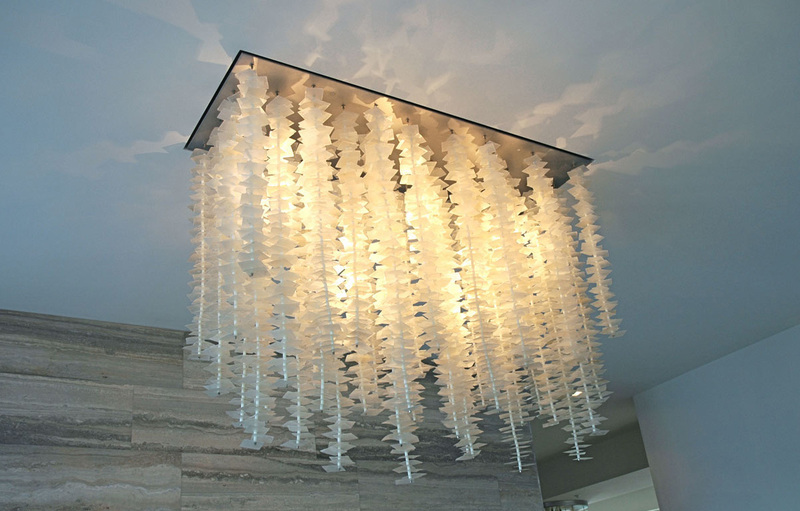 Propellor has created the “Sombrio” chandelier, named after Sombrio beach on Vancouver Island, which references the seaweed that washes ashore. Anyone who has visited Canada's oceans and lakes of can picture seaweed waving gracefully underwater as the waves roll in to the shore. I think this movement is perfectly captured in the “Sombrio” light. “42 Point” (below) is a lighting sculpture custom designed for a boutique in Banff, Alberta. 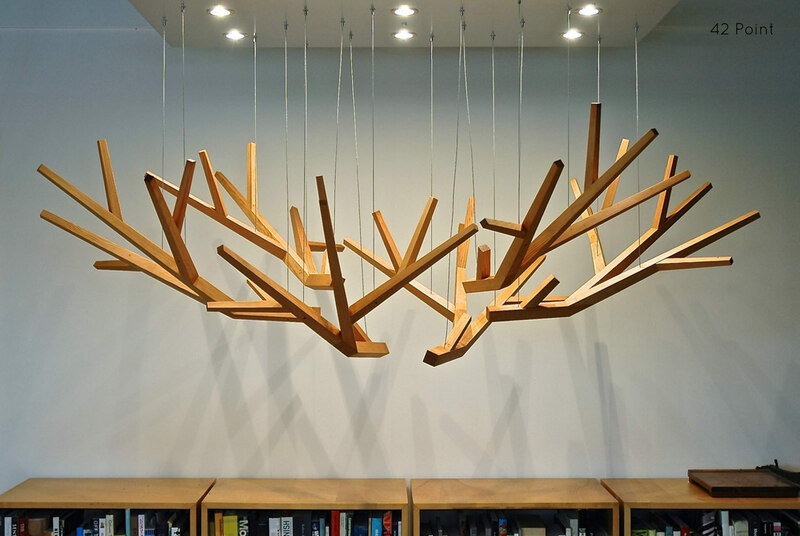 Crafted from reclaimed douglas fir, the design echoes the natural structure of majestic elk antlers. I think this fixture does an amazing job at creating a dramatic focal point wherever it hangs. 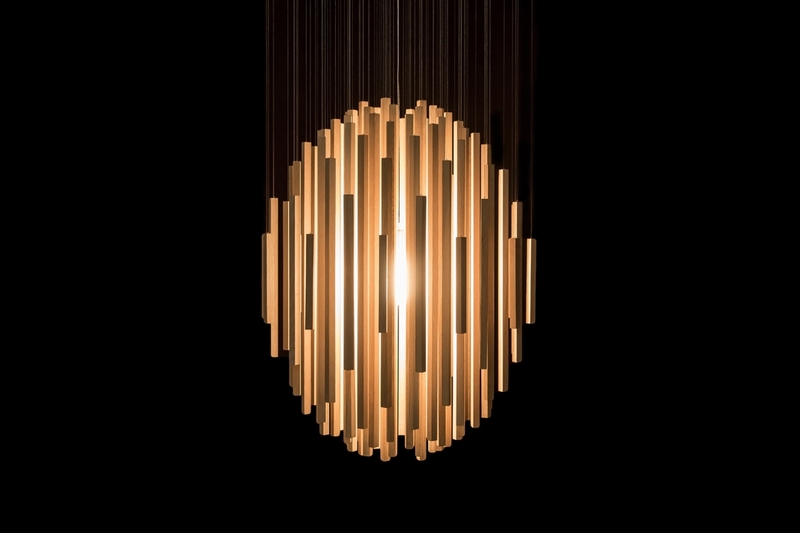 The patterns of light and shadows created by this fixture will transform any room! Inspiration is also drawn from the sky. In “Cumulus” (pictured below) small translucent rectangles are layered to create the impression of a fluffy and weightless cloud. This bespoke product comes in many sizes and shapes, making it possible to create a whole skyscape of clouds indoors! Finally, we have an urban landscape reflected in a range of pendant lights in the “Calvino” collection, named for the author of Invisible Cities. Hung together, or individually, a new type of cityscape can be created with these products. It is easy to imagine that these bamboo pendant lights really are miniature office buildings and apartment blocks futuristically floating in the sky. Canada's built and natural landscapes have a lot to offer, and Propellor channels this diverse beauty into all of their designs. Propellor’s website also showcases their brilliant custom lighting design done for various projects in Canada and beyond – if you happen to visit any of these spaces, make sure to look up and see the products that are “lighting the way” for modern Canadian design!